Not satisfied with taking on gun rights in the US Constitution, Piers Morgan is now calling for a Bible rewrite. The far left CNN crank wants a “gay marriage amendment” to the Bible. Some people think they are God. Then there’s Piers Morgan. On Monday’s episode of “Piers Morgan Tonight,” the British host called for a ‘gay marriage amendment’ to the Bible. 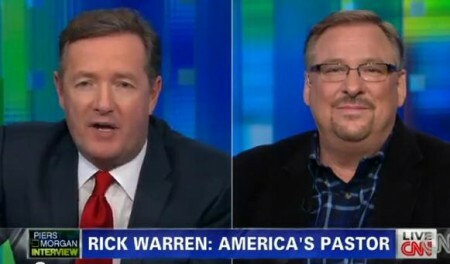 “My point to you about gay rights, for example, it’s time for an amendment to the Bible,” Morgan told his guest, Pastor Rick Warren of Saddleback Church. “Not a chance,” Warren responded. Morgan’s comments sparked outrage on Twitter, with individuals asking who the host thinks he is to ‘amend’ the Bible.